A few recipe variations for Scarpetta’s Spaghetti with Tomato and Basil sauce are floating around the internet but I followed the one from Steamy Kitchen while tweaking it just a bit for my own liking. (Steamy Kitchen uses tomatoes and paste while I only used tomatoes). You start with 20 fresh Roma tomatoes … peel’ em and de-seed ’em. Then throw them in a big pan or soup pot with extra virgin olive oil over medium to medium high heat. Add a little salt and pepper along with crushed red pepper flake and let them stew. Once they cook down a bit – about 10 to 20 minutes – mash them with a potato masher. My daughter puts her cooked tomatoes in a blender to make it smooth, but I like mine slightly chunky so I just use the masher. Plus it’s fun to mash ’em up. While the tomato sauce continues to cook, you can start making the Garlic and Basil Olive Oil that you’ll drizzle over the dish. 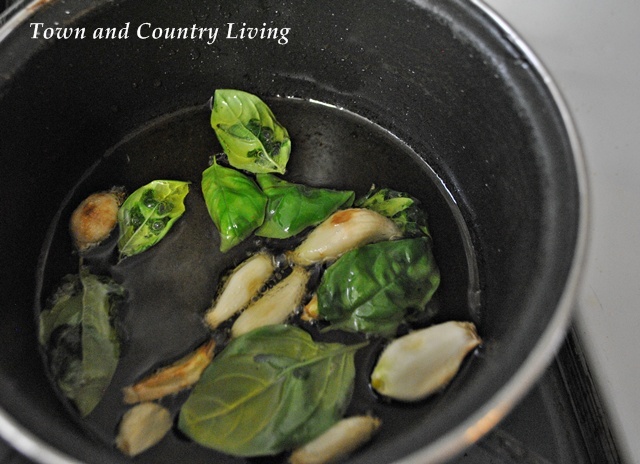 You’ll infuse Extra Virgin Olive Oil with 6-8 cloves of garlic and 10 basil leaves. Allow the oil to cook until the garlic starts to brown (about 10 minutes). Then take the mixture off the burner and let it all sit in the pot for another 10 minutes. While the oil is resting, cook your pasta 3/4 of the way, according to directions. If you’re especially resourceful, you can make fresh pasta. 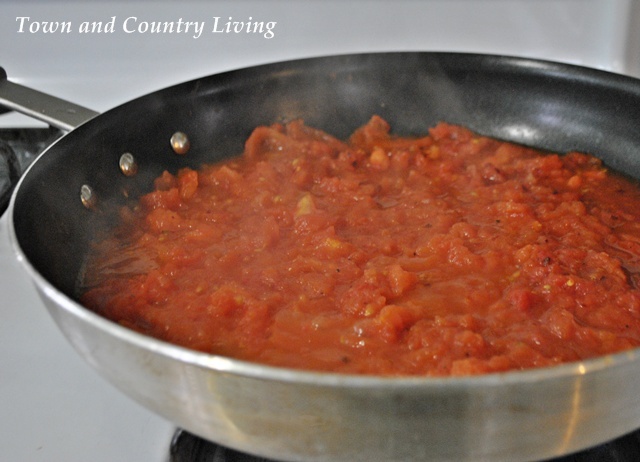 Once the pasta is almost cooked, put it in the pan with the tomato sauce and toss. If the sauce is too thick, add the reserved pasta water as desired. After a few minutes of cooking the pasta with the tomato sauce, turn off the heat and then add the remaining ingredients. 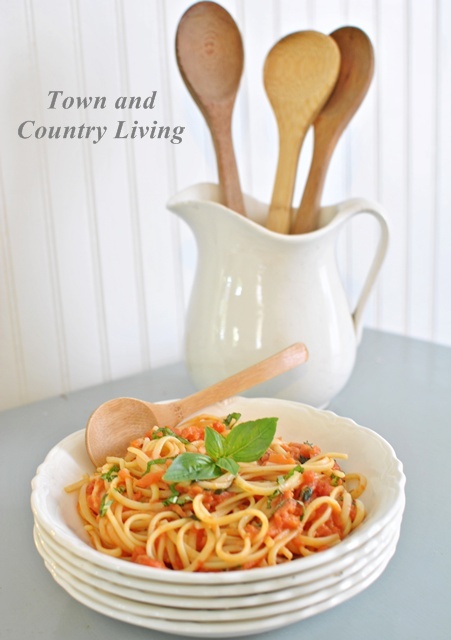 Place spaghetti on plates or in bowls and then drizzle with a bit of the Garlic Basil Olive Oil mixture. Sprinkle with more Parmigiano-Reggiano cheese and enjoy with a glass of fine wine! We like to end this meal with a serving of Dark Chocolate or Sea Salt Caramel gelato. It’s like we dined at a fine Italian restaurant … without paying $24 for the spaghetti! Peel and de-seed the tomatoes. To peel, cut a small X on the end of each tomato and drop in a pot of boiling water (you can put several in at a time). After about 15-30 seconds, remove the tomatoes from the boiling water and place in ice water. Pull a corner of skin from the X mark and remove the skin from the tomato (you can use a peeler for tough spots). After removing peels, cut tomatoes in half and flick out the seeds with your fingers. Heat 2 T. of oil in large pan or pot and then add the halved tomatoes, a pinch of crushed red pepper flakes, and a little salt and pepper.. After cooking for about 10 minutes or so, mash the tomatoes down with a potato masher. I like to leave mine slightly chunky. 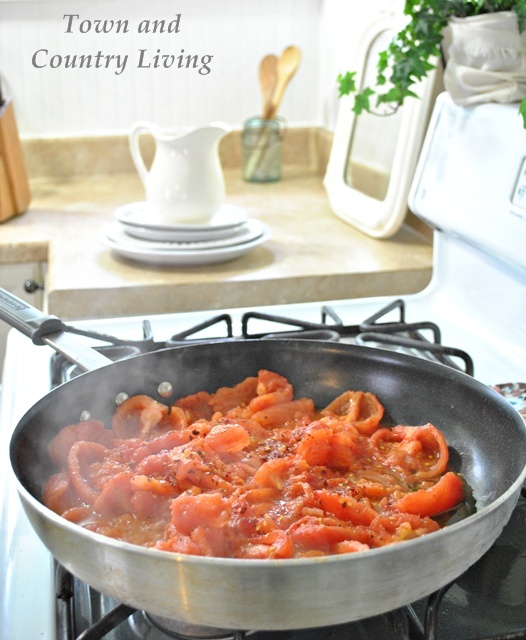 As the tomatoes continue cooking, prepare the oil mixture. Heat 1/4 c. olive oil in small pan and add garlic cloves and basil leaves. Continue cooking for 10 minutes or until garlic starts to brown. Remove the pan from heat and let the oil rest. While oil is being infused with the garlic and basil, cook the pasta for 3/4 of the recommended cooking time. Drain the pasta and reserve 1 cup of the pasta water (you may not end up using it). Add the pasta to the tomato sauce and mix vigorously while allowing the pasta to finish cooking. If the tomato sauce is too thick, add a bit of the pasta water to thin it a bit. 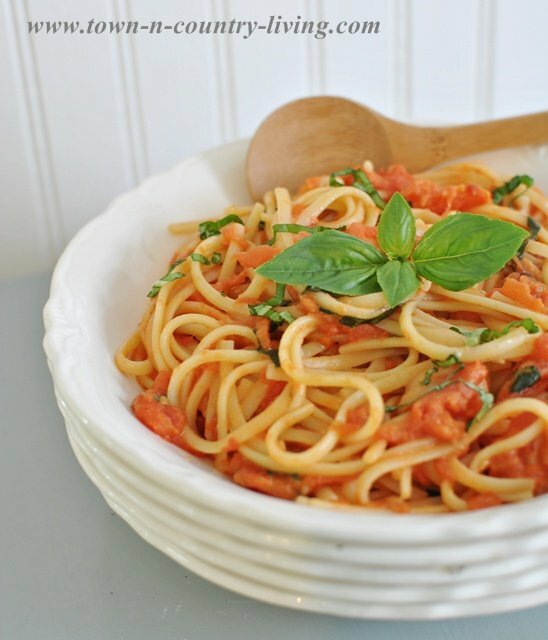 By cooking the pasta with the tomato sauce for the last few minutes, you allow the pasta to soak up the tomato flavor. Turn off the heat and add the butter, basil, and cheese to the pasta and sauce. As you stir the ingredients together, the sauce will turn slightly orange. Once the butter and cheese have melted, place the spaghetti on plates or in bowls and drizzle with the Olive Oil mixture after removing the garlic and basil. Sprinkle more cheese on your spaghetti after serving, if desired. Yum Jennifer! We have never had pasta this way.Hard to believe because we eat allot of pasta! I am going to make this dinner this week! Thanks so much for sharing this delicious and easy meal! Oh YUMMY! Jennifer this looks divine! A great pasta makes a company worthy dinner! Your’s sounds just delicious. I am a huge fan of basil and garlic… but I never thought of putting them together to make an oil!!! This is a must make for me! I hope you share this at ON THE MENU MONDAY. Link goes live Sundays at 8:00 Everyone will love it! OH MY GOD. I am so making this tonight – and pinning it for future reference. I can’t wait to eat this!!!!!!!! That just looks sooooooooo yummy! I love to do spaghetti with garlic and oil. A little parmesan cheese and yum! Definitely going to this recipe! WOW … that looks so good and your lovely pictures make it look even better. Yumm. Out to dinner last night my husband had a pasta dish with fresh basil and walnut sauce. Yum, yum, yum!! I just love cooking from scratch – so much more flavor! This looks soooo good. I’m visiting you today from Uncommon Slice of Suburbia. I co-host a Linky Party Tuesday and would LOVE for you to add this. I hope you get a chance to stop by my blog, leave a comment and Link Up, too!